In case you haven't noticed, Brisbane is really living up to the old 'Beautiful one day, perfect the next,' slogan. As the days get warmer it's becoming harder and harder to stuff down the heavy, delicious cakes and desserts we were indulging in during winter. It's also becoming harder to hide their effects under baggy jumpers. Never fear, Brisbane, we've rounded up some of Brisbane's best raw sweet and treats from some of Brisbane's best cafes as a lighter, healthier way to satisfy that sweet tooth of yours. Newstead's newest raw-food haven is Press'd, a delightful cold-pressed juice and raw cafe with a rotating menu of raw favourites. Their selection of raw sweets include raw cheesecakes, slices, and paleo protein balls and bliss balls, while their always changing raw lunch menu features very naughty-sounding, very good for you options like raw tacos, raw burgers, raw nachos, raw pad Thai, and enchiladas. Hot tip: Press'd do a wicked raw banana bread with vanilla cashew cream and fruit for breakfast! Keeping it real on Brisbane's Northside, 48 Degrees RAW Cafe serves a delicious range of raw sweets out of its Windsor location. Check the specials board for tempting treats like rich almond, caramel tartlets, gooey caramel slice and maqui and almond milk crepes with coconut yoghurt, blueberry chia jam, banana and special sprouted, activated grawnola. Inconspicuously tucked into one of the old shopfronts along Stanley Street in Woolloongabba, Clarence Corner Book Shop's walls are lined with thousands of pre-loved books. Open Monday to Friday, duck in for a coffee and a piece of delicious raw cake or chocolate brownie in this chilled-out little space. Hamilton gem, Orawgi prides itself on making delicious, healthy food from locally sourced produce. Sweets and treats are not just beautiful to look at, they're also delicious to eat. They include rhubarb, orange and ginger cake, double layer lemon cake and spiced beetroot and vanilla slab. James St's hip-hop-happening spot serves great coffee and smoothies and a wide selection of raw goodies including chia puddings, white chocolate and raspberry cheesecake, top-deck slice, lemon and coconut cheesecake and cherry ripe slice! Press if a Brisbane healthy cafe fave for good reason. 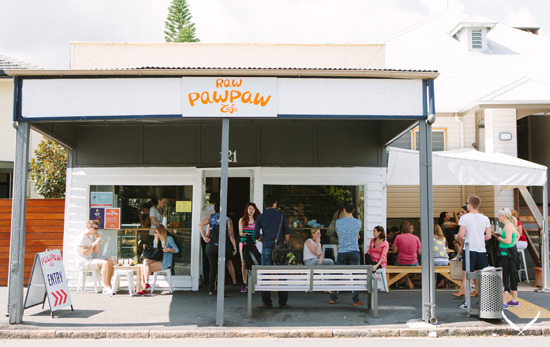 Pawpaw Cafe's alternative little sister, Raw Pawpaw is all about raw, clean living and is selling nourishing sweet treats to New Farm punters. Tasty raw bites on offer include pina colada cake, raw citrus cake, date and caramel slice and summer slices like super green kiwi and mango and quinoa. Sandgate locals rejoice! The raw food revolution is on your doorstep, thanks to Satori Organics Wholefoods and Juice Bar you can pick up delicious, raw, paleo food and treats including honey and lavender cheesecake, blueberry cheesecake and beetroot donuts. Based in West End and Toowong, and with a brand new inner-city SOL Breads for northsiders, SOL Natural Foods, SOL Breads Cafes have a great range of delicious raw sweets and treats including chai cake, mango and coconut cake, lemon and ginger cheesecake, raw cacao tarts and snickers slice. These dreamy looking desserts are almost too pretty to eat! Almost. If your sweet tooth strikes in the city, head to Raw Juicery on Adelaide Street for a quick fix. Grab a refreshing juice or smoothy and one of their raw cakes and slices from the Carrie on Raw range, including Ferrero Rocher cake, sticky chocolate cheesecake, pecan and caramel cheesecake and tiramisu. Food photographs posted by Raw and Peace on their social media are beautiful and tummy-churning. This talented team sell their pretty creations at the Northey Street Organic Markets every Sunday. Treats include raw blueberry, vanilla and lavender muffins, cookies and cream brownies, vanilla cream cake with berries and pistachio and mint slice brownies. Visit the Kunara Organic Cafe in Albion for an organic Montville coffee, fresh green smoothie and a stack of organic, raw, gluten-free sweets, cakes and chocolates. The little sister of well-known Sunshine Coast Kunara Organic Cafe, this lovely space is sure to please. Sweets include chocolate-berry cheesecake and key-lime pie. Because food trucks can be raw, vegan and healthy too, guys! Healthy Humans Mobile is ripping around Brisbane in a caravan brightly painted with fruit and vegetables. They serve raw, sugar-ree, dairy-free, gluten-free, nut-free and wheat-free food and sweets include neapolitan cheesecake, turkish delight cheesecake and walnut and cranberry brownies. Check their website for locations. Visit the Eagle Farm Markets to pick up some of the amazing raw sweets being made by Nutri Hitt. These guys have been receiving rave reviews from Brisbane's raw-food aficionados and converting a few non-believers too. Sweets include an assortment of tempting slices like bounty, lemon, fig and pistachio and chocolate, hazelnut swirl. Check the Nutri Hitt Facebook page to see which Brisbane cafes are now stocking their goodies! Phoebe Lee is a freelance writer and travel blogger who loves dogs, Tupac and warm, tropical holiday destinations. Never happy to be tied down or standing still, Phoebe loves the feeling of freedom that comes with travel. Instagram: @littlegreybox_phoebe.